These are lyrics by Baccara that we think are kind of nonsensical. 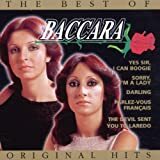 Baccara's, "Yes Sir, I Can Boogie"
"You wanna know if I can dance." Well, you already explained it in the title (since boogieing is a dance). What you should've said is "You *wanted* to know if I *could* dance". And the subsequent lines sound like fourth-wall breakage.